Keep up to date and stay connected! Learn about the latest school news, programs and events! Please take a moment to ensure we have your updated contact information so you never miss any news. Contact Limor Elkoby, Director of Advancement at advancement@azrieli-tth.ca or 514-739-2291 ext. 224. We love hearing from you! Herzliah graduates represented 2/3 of the students who went on the recent MedLife trip to Peru during the winter break to work with people from low-income communities and help improve their access to medicine, education, and community development initiatives. “I was truly humbled and proud of the difference we made in Peru in the communities with low-income families. Leading a group of 30 students was challenging, but very worthwhile after seeing the great success of this trip. Hopefully, this will be the first of many acts of Tikkun Olam”. Noah Abitbol ’16. Graduate David Bouhadana ’16. said, “After seeing so many smiles, this experience helped me understand the importance that Tikun Olam has in our world. I hope that our actions will help inspire others”, David Bouhadana ’16. Herzliah “leaders of tomorrow” in action today! Alumna Monica Mendel Bensoussan ‘81, is making a difference! During her tenure as President of our school, and now as Immediate Past President and Chair of the Building Project she is at the helm of the new building project for Herzliah. The dream of building a new state of the art high school on the Montreal Jewish Community Campus is coming to fruition at this time in our history largely thanks to her exceptional leadership. Click here for more information. This past Saturday night, we had the pleasure of welcoming the Herz class of 1989 and Class of 1993 to the new Sylvan Adams Campus. Over 50 alumni attended including past teachers and former principal Jill Guedon. It was so nice to see our alumni laugh, reminisce and share stories! A special thank you Dan Vigderhouse ’89 and David Stolow ’89 for organizing this fabulous reunion. 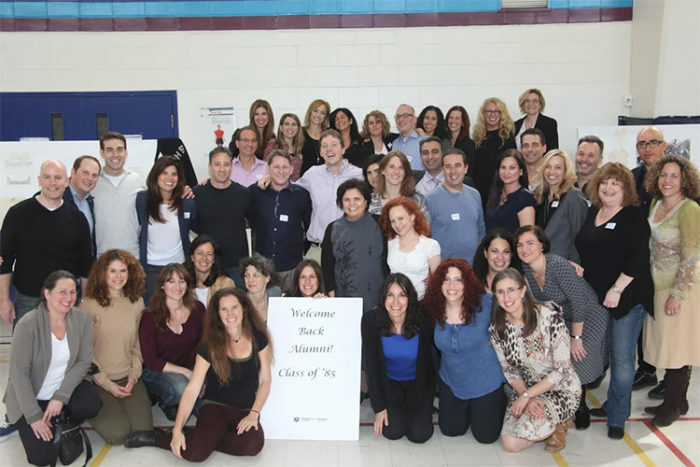 An incredible time was had at the 1980 Herzliah Reunion on September 18, 2017. Graduates from near and far gathered and had an incredible time catching up with friends and reminiscing about their times at Herzliah! Special kudos to organizers Renee Pearl, Sheryl Gross Cape and Debbi Rosenthal – from the cupcakes, to the holders, to the signage – everything was wonderful! Yashir koach also to Naomi Wise whose montage video was wonderful. 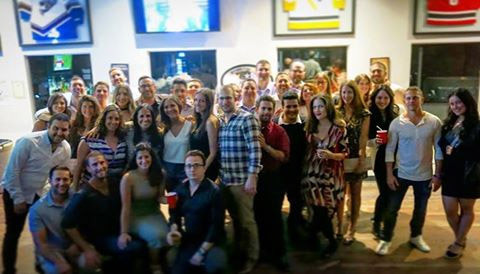 The class of 2006 held their reunion in late what and had a wonderful time catching up with their schoolmates! Close to 40 alumni attended and $1,200 was raised. This amount was divided between the fund of our beloved teacher Sarit Malca z’l and classmate Jaclyn Lea Fisher, z’l who lost her battle with Crohn’s disease. 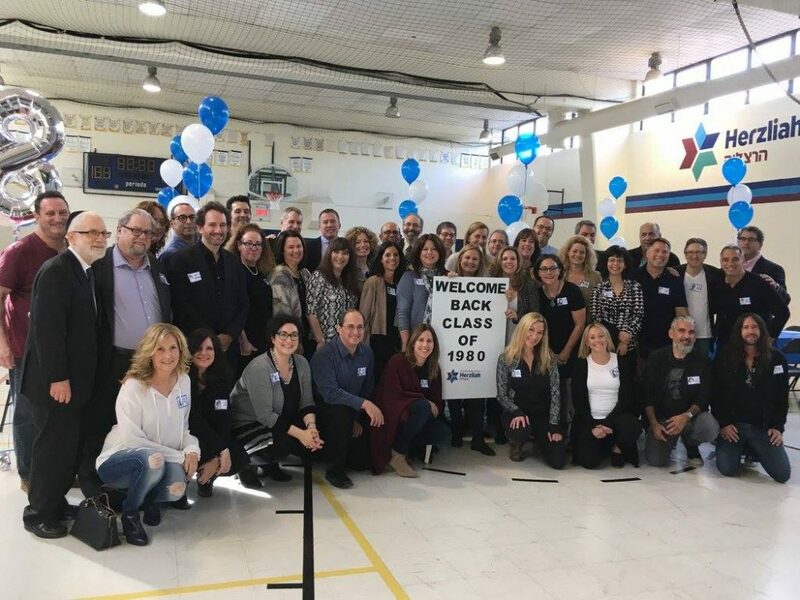 The Herzliah class of ‘85 held their 30th class reunion last October, in the high school gym! It was a beautiful event with over 50 alumni and 4 teachers in attendance. 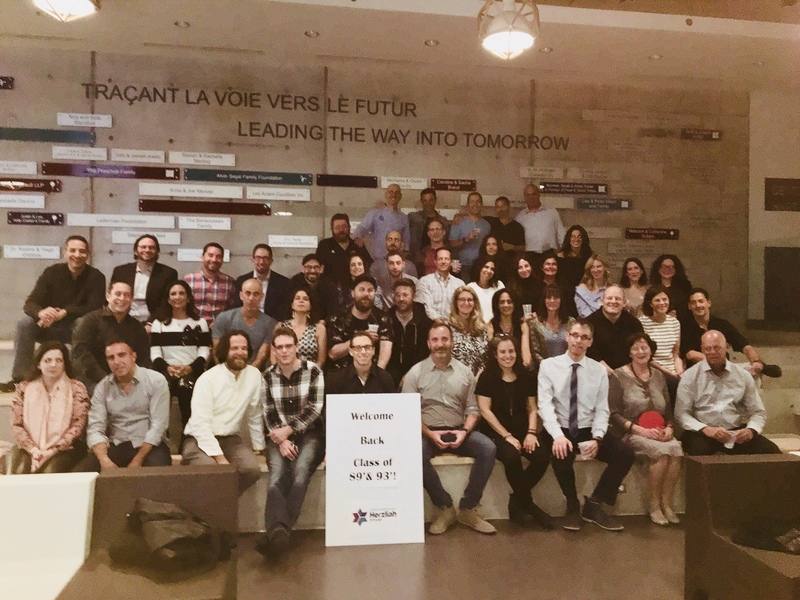 Alumni arrived from around the globe, from Toronto, New York, Ottawa, Boston, Vancouver, Tel Aviv, Paris and England to name a few. There was much catching up, laughter, and reminiscing over memorabilia displayed throughout the gym! A huge Yashir Koach to Beth Gamulka and Jennifer Schechter Bay for bringing everyone together!